Arsenal's winless streak against the top six away from home continued as they were comfortably beaten by Manchester City at the Etihad. The hosts entered into this game with an abundance pressure to secure all three points after the defeat to Newcastle United on Wednesday. 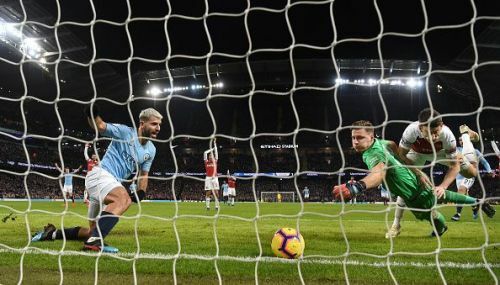 Unai Emery could not have asked for a poor start when Sergio Aguero scored a header from close range to open the scoring within 50 seconds. Soon after, Gunners skipper, Laurent Koscielny headed the ball from a set piece to equalize the score. But, a lapse of concentration from Lichsteiner saw Raheem Sterling assisting the Argentine again who took uttermost advantage to take the lead into the half-time. In the second half, Arsenal looked shattered and never really had the energy to go toe-to-toe against the Citizens. 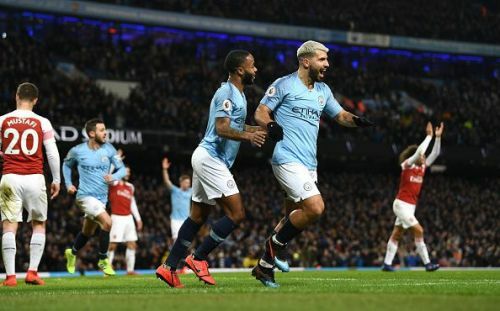 The hosts were tormenting the defence and eventually got the much decisive two-goal cushion when Aguero was on the end of another goal to register his hat-trick. There were some individual performances which caught the eye in this game. In this article, we shall look at five hits and flops. Just like the last game, Sergio Aguero was at the end of the right end and the Cityzens took their early lead through him. The Manchester City striker was at the right place at the right time to finish off chances with ease. In general, he did not have much to do, but his devastating finishing came into effect by securing his tenth hat-trick in the Premier League history. The 30-year-old had to pass only 25 times throughout the game, but he looked significant with his linkup play with Raheem Sterling and Bernardo Silva. He hit the target 100% with four shots on target from the equal amount. He did the defensive part of the game by tracking back and completed two tackles which helped him secure the Man of the match award. He was constantly threatening the center-backs Laurent Koscielny and Shrokdan Mustafi by running behind them to stretch their defense and cause havoc.